Skype Recorder Lite is the most requisite mate for Skype conversations. It auto starts with your Skype, and records Skype calls in high quality audio files. It comes with a clean interface, you can easily know what to do next at the first time you used it. The new released Skype Recorder Lite enables you to change skins as you wish. 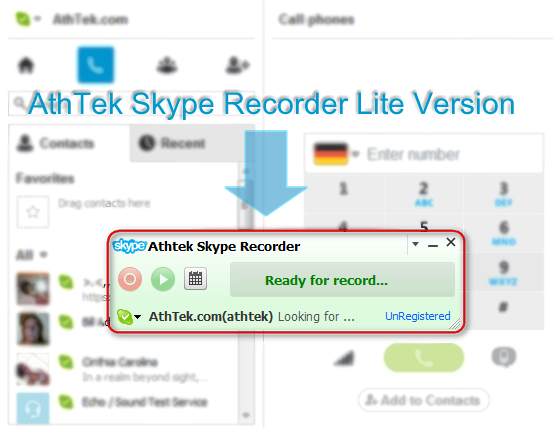 If you are looking for a personal Skype call recorder, Skype Recorder Lite is your best choice. As you maybe know, our Skype Recorder Pro has been awarded as Best Recording Quality a few months ago. The new Skype Recorder Lite has inherited this feature. Also it has many other new features. Skype Recorder Lite has a smaller interface than Pro version, and you can change the interface color as you wish. It removed some business use functions and make itself more suitable for personal Skype call recording. Think that you have just made a Skype call. You superior has just referred to some figures for a reception, how many guests will come and how many rooms should be reserved. You are confident that you can keep those figures in mind and did not jog them down. Then you make a call to the hotel, and your mind gets stuck when the other side asks for the number of visitors. Ask your boss for the number again? You will not seem so adequate for your work. Then you must sigh - if only your Skype can record those important conversations for you. If you are looking for a cute personal Skype Recorder, you will love this Skype Recorder Lite! Free voice recorder with the widest range of features: 1) Record a voice message, add a photo, screenshot or personalized ecard and share via email, Facebook or the cloud. 2) Add voice comments to photos. 3) Keep a voice diary, add photos and text. Fast mp3 recorder for the achievement of [the line, microphone and audio player] unlimited MP3 recording / WAV audio software, the software provides audio playback, audio size display, and other functions, is a very good MP3 recording tools. Record any sound that is played through your sound card or from other sources like a microphone, CD/DVD, or line-in. You can capture the audio from videos or music that you are playing in a media player or which you are streaming from the web. Swifturn Free Sound Recorder is able to record, technically, any sound you hear. The output is direct with no temp trash created, which means you can get an audio file in the output location after the recording without converting it. OGG to MP3 Converter is an easy, efficient, fast yet free OGG to MP3 converter. It is capable of converting OGG to MP3 easily and quickly. Audio Recorder for Mac can record sound from any internal or external sources such as Microphone, CD player, line-in devices and other applications(like Skype, iTunes, or DVD Player)into WAV, ACC or AIFF format. It can also extract music from movie. This site does not contain serial number, crack, keygen Skype Recorder Lite serial number : serial number is the simplest type of crack. A serial number(cdkey,product key,etc) is register the program as you may already know. a crack or keygen may contain harmful software. If you cannot find the exact version you want, just give it a try. for more information read .nfo/.txt/.diz file include in zipped file.